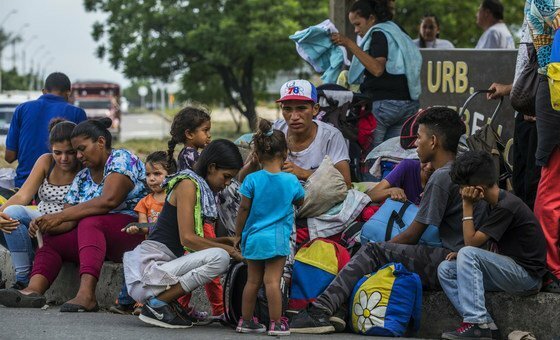 Over a month after two competing resolutions on Venezuela failed to pass, the UN Security Council met on Wednesday to discuss the “very real humanitarian problem” facing the country, where close to seven million people are in dire need of aid, and some 5,000 people continue to flee across borders every day. This was the fourth meeting of the Council on Venezuela, since the first one took place on 26 January. With both Russian and United States draft resolutions failing to pass in February, US Vice-President Mike Pence briefed the Council on Wednesday, calling on the UN to recognize interim leader Guaidó as the legitimate President, revoke the credentials of Venezuela’s current Permanent Representative and seat Mr. Guaidó’s nominee in his place “without delay”. But Russian Ambassador Vassily Nebenzia said the US was looking to install its own “pawn”, describing the US effort as a “lawless, thuggish violation of international law”. “There is a very real humanitarian problem in Venezuela,” said Mark Lowcock, the UN humanitarian chief. “We estimate that 7 million people in Venezuela need humanitarian assistance. That is some 25 per cent of the population,” he added, noting that the situation further deteriorated recently given the “recurrent widespread power outages”, which have hampered the capacity to deliver many services, including water and sewage systems, as well as medical care. 3.7 million are believed to have suffered from undernourishment in 2018. 2.8 million people are estimated to need health assistance. 400,000 cases of malaria were recorded in 2017, a 70 per cent increase from 2016. 17 per cent of people living in poverty have no access to safe water, or receive it only once a fortnight. 2.7 million vulnerable people in the country need of protection assistance. The United Nations has been expanding its humanitarian operations, releasing US$9 million from its emergency response fund, the CERF, and increasing the number of staff in the country from 210 to 400. “Our efforts are in line with the humanitarian principles of humanity, neutrality, impartiality and independence,” Mr. Lowcock said. Dr. Kathleen Page, a professor at Johns Hopkins University’s School of Medicine, also briefed the Council based on recent findings from the non-profit organisation Human Rights Watch. She stated that the country was facing a deep health-care crisis, with a measles epidemic that could stand at 9,300 cases, and a diphtheria outbreak that could have affected as many as 2,500 people. Regarding the situation of migrants and refugees outside the country, Eduardo Stein, the Joint Special Representative of the UN refugee and migration agencies (UNHCR and IOM) described the current “population outflow” as “unparalleled in the modern history of the region.” There are currently 3.7 million Venezuelans living outside of their country; 4 in 5 of them left after 2015. “Last year Venezuelans left the country at a net rate of 5,000 per day and they continue to leave the country despite recent border closures on the Venezuelan side. If the trends in 2019 continue, we estimate that the total number of Venezuelans outside the country will exceed 5 million by the end of the year,” he warned. He listed some of the factors that are pushing people to leave, sometimes under “very dangerous conditions”: insecurity and violence; lack of access to food, medicine and essential services; loss of income and lack of effective national protection systems. As more than 20 countries are affected by these population movements, the Special Representative insisted on the importance of a harmonized multilateral approach regarding reception conditions, stay requirements, services offered by receiving countries, efforts for cultural integration, and access to rights and legal documentation. Meetings to address these key issues have been taking place in Ecuador, with the participation of a dozen countries, several UN agencies, international cooperation agencies and financial organisations. Argentina and Paraguay have agreed to host the process hereon after. “Despite these efforts, national capacities are increasingly strained, in some cases with the risk of denial of entry or access to regular migration schemes,” deplored Mr. Stein. UN humanitarian chief Mark Lowcock and Special Representative Stein made five keys asks to the 15 members of the Council. Recognizing recent steps taken by the Government of Venezuela to facilitate the entrance of additional humanitarian staff into the country, the UN relief chief said more organisations are needed on the ground, as well as additional data to ensure that the understanding of the needs “evolves with the situation”. Thanking Member States for the funds already provided for the humanitarian response, both Mr. Lowcock and Mr. Stein stressed that “a lot more” is needed give the scale of the crisis. The initiatives adopted in the multilateral meetings in Ecuador require more support, as do the States “employing open doors policies to receive, assist and host Venezuelan outflows”, Mr. Stein explained. The UNHCR-IOM Special Representative noted that, by addressing the needs of host communities too, “we can increase the impact of the humanitarian response” as well as “mitigate the possibilities of xenophobic expressions”. As Member States laid out their views, the US Vice-President said that the United States had simply been “standing with the people of Venezuela” who have been “devastated by the Maduro regime”, by positioning humanitarian cargo at the border and by funding humanitarian operations. He said that “all options are on the table” for resolving the crisis, stating that the time “is up” for Mr. Maduro. Mr. Pence announced that the US was preparing a Security Council resolution “recognizing the legitimacy of Juan Guaidó” and he asked all UN Member States for their support, beyond the several dozen countries which have already done so since the beginning of the year. The Permanent Representative of Venezuela to the United Nations, Samuel Moncada, responded by stressing that Venezuela has suffered under the weight of international sanctions and asset freezes.